Here in Oahu the selection of beautiful beaches is second to none. Below is our selection of the best family friendly beaches that your family simply cannot miss. 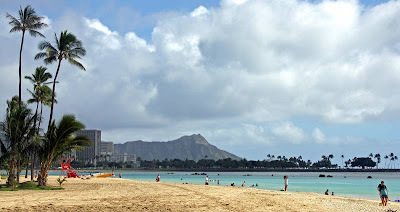 Ala Moana is a great beach for kids because it is always calm and it is close to the heart of Waikiki. You can build a sand castle, try paddle boarding, or take in the great view of Diamond Head. When your done with beach, you can walk across the street to check out the Ala Moana Mall and grab some lunch at their massive food court. Prior to entering the park, everyone must watch a short film about conservation of the reef and the safety rules. Snorkel Gear is available for rent as well as snacks and concessions. Check out our experience here. The Halona Beach Cove is located at same site as the Halona Blowhole. This beautiful cove will give your family a private beach experience. Sea Turtle sightings are common at this beach. Use caution walking down the path with kids and be mindful of the surf conditions in the winter. Check out my post on the Halona Blowhole for more information. Diamond Head Cliffs is one of our favorite beaches. Located minutes away from Waikiki Beach, this is a great beach to take the family to escape the crowds. In the Summer time it is not uncommon to spot Hawaiian Monk Seals basking in the sun. For our family experience check out our post on Diamond Head Cliffs. Lanikai Beach is located in a Kailua residential area and is consistently ranked as one of the world's most beautiful beaches. Two small islands just off the coast (Moko Nui and Moki Iki) can be reached via Kayak. Lanikai beach is considered the nicest beach on the Oahu by most. For directions and information, check out our day at Lanikai Beach. Pupukea Beach Park, is a Marine Life Conservation Area. At the south end is Three Tables, a protected beach with three sections of flat coral reefs. 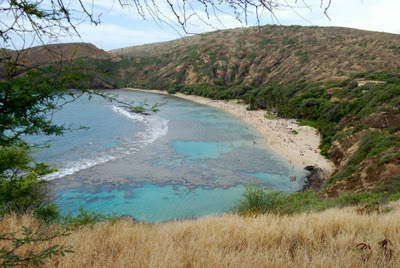 At the north end is a lagoon called Shark's Cove which is perfect for snorkeling, beachcombing and tide pooling. Pupukea Beach Park provides a great alternative to Waimea Bay on the weekends when parking and crowds are an issue there. For the full review and address, click here. Kualoa Beach Park is located on the east side of Oahu in Kaneohe across the street from the Kualoa Ranch. Parking is free and is right in front of a sprawling lawn facing one of the most beautiful beaches on the island. The island off in the distance is called Chinaman's Hat and is accessible by Kayak. Kualoa Beach Park also offers an awesome view of the Ko'olau Mountain range. Many Hollywood films were also shot at the Kualoa Ranch right across the street. Click here for the Kualoa Beach address. Located on the windward side of the Oahu, Kailua Beach is known for its fine white sandy beach and very small, if any, waves. These conditions make it a premier beach for kayaking and outrigger racing. Children will revel at the huge tidal pool, a popular social gathering for kids of all ages. For directions and more info check out our post on Kailua Beach Park. Snorkelers will revel in at the clarity of the water, the abundance of marine life, and calm conditions. Click here for more information on this beautiful hidden gem.